Although there are many Turkish eating houses or snack bars in Antwerp’s streets, Bodrum Palace is the only real Turkish restaurant. The food is extremely tasty and fresh and there is a variety of dishes on the menu. The interior is really cosy and typically Anatolian. The lights are dimmed, which always creates an intimate atmosphere. 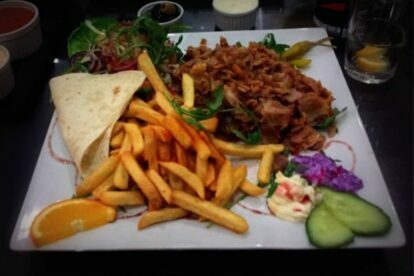 Bodrum Palace is located at the corner of Van Maerlantstraat and Sint-Jansplein and is well known for its deconstructed Kapsalon. The staff is very friendly and fast. Usually, I order take-out at this restaurant and while I’m waiting I’m always served Turkish tea, which is very sweet, very hot and just right to prepare my taste buds for the delicious meal. Personally, I find that Bodrum Palace serves the best Turkish food in Antwerp and I know for a fact that locals with Turkish roots also find this to be the best place for Turkish food.